There are days I get burnt out as a stay-at-home mom. This has been one of those weeks. I love my kids and spending time at home with them everyday. However, there is also the flip side. I started working as an intern when I was 17. I stayed at the company for 7 years until I moved to West Virginia. During grad school I worked three jobs, including teaching a class. I met my husband and got married during my master's program and have stayed home since. Then there are the moments when you realize all the things that your high-school friends that got married and had kids later have accomplished. Some of them have been very, very successful. There is always that awkward situation when everyone that I knew back in Seattle talks about how smart and successful I was when I was younger. I know they don't mean it the way it comes out, but it still gives me pause. My husband thinks that I should start claiming that I work at home since I blog and take care of the household. Maybe he's right. I can always hope that one day my blog will become vastly successful, but we all know that's unrealistic. In the meantime I remind myself that my kids are growing up surrounded by my love and knowledge. That's enough rambling for now, onto the cooking! This weekend I chose to keep my cooking simple and I relied on my slow cooker. 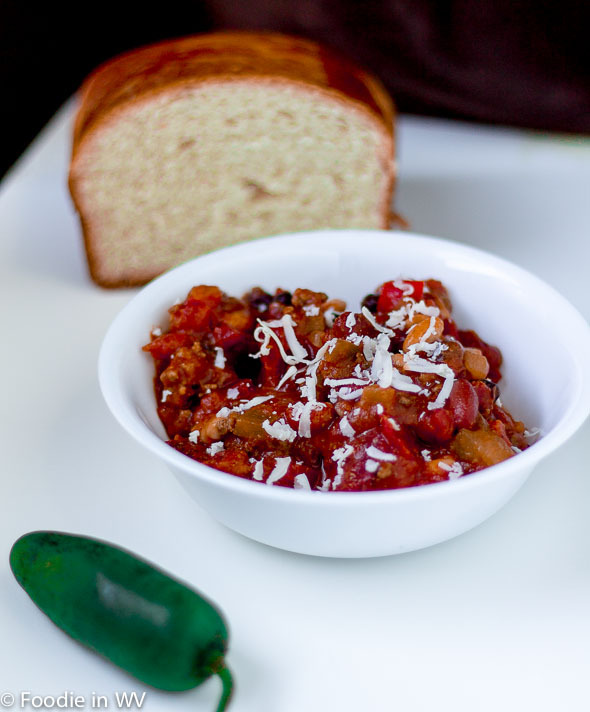 I tried a new recipe for Spicy Pumpkin Chili from the new All Recipes magazine. This recipe has 18 ingredients. It takes 1 1/2 hours of total time, 15 minutes of which is active and makes 10 servings. I did make a few changes to the original recipe. First, I allowed my chili to cook in the slow cooker for 4 hours on low. I like my flavors to fully come to fruition so I increased the total cooking time. It would also work well on the stove in a dutch oven or a big pot with a lid. I was unable to find my crushed red pepper flakes, so I was forced to leave them out. Finally, I used a full 8 ounces of tomato sauce with garlic. I also found that I needed to add more salt than the 1 teaspoon suggested by the recipe. My husband liked that this recipe has the health benefits of pumpkin without the taste being overly noticeable. He isn't a big fan of pumpkin, but he was surprised by how much he enjoyed this recipe. I love pumpkin and chili so this was a dish I really liked. It made a very big batch, more than enough for at least 10 servings. For the servings for my kids I added cheese and sour cream. They aren't big chili fans so these additions made them willing to eat their bowls. If you like your chili on the spicy side I would suggest adding jalapenos or a bit of cayenne. Since I cook with my kids in mind I always try to have my recipes be on the mild side. For the recipe go to Spicy Pumpkin Chili. The folks that work outside the home are wishing they spent time at home with their kids too. What you do everyday is amazing and the long term benefits are going to pay handsomely. Cheers to you! I never thought of a pumpkin chili but quite frankly it sounds fabulous. I haven't thought of using pumpkin in chili either, but it worked really well. Thanks for the sweet comments! Thanks :) I agree that it seems like whatever the choice we always wonder about the alternative! I'm good at it too, I just need to build a thicker skin I think :) Thanks for such sweet comments, I really do appreciate it! See, I don't care what other people think. I do what is right for me and when I go to my high school reunion in the fall & they look down their noses at me - I'll just walk away proudly. My kids are my greatest accomplishment and I'm happy to say that I was here and involved with them and helped make them the awesome humans they are. I need to borrow your attitude :) I have never been good about thinking like that, I need to grow a thicker skin! Looks great! During the winter months, I hosted a pumpkin potluck playdate, which was a lot of fun. We shared Pumpkin Chili, Pumpkin Macaroni and Cheese, Pumpkin Soup, Pumpkin Pie, and Pumpkin Bread. I plan on hosting it again this year, I may have to try this recipe out this time! I love the idea of a pumpkin potluck, I would go in a heartbeat! This is going on my Fall to-do list (sadly it won't be too awful long until cooler weather for us comes back). And who cares what other people think (even those who are friends) it's ultimately our own personal happiness that matters most, and I think being happy is the highest of highest accomplishments. Wow, this looks amazing! It's making me crave cool evenings and football. I'll definitely be referring back to this one in the fall. YUM! I am reading for cooler evenings and fall too :) It has been way too hot here! I wish it wasn't so hot out or I would make a batch of chili! Also, who cares what they think. You sound like a great mom who is raising a great family! It has been way too hot here too. Thanks for the sweet comments! Glad I'm not the only one :) I can be my own worst enemy sometimes! OMG, I love finding new slow cooker meals to try! YUM!! !